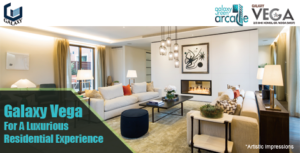 Galaxy vega is one of the finest residential project of Galaxy group in India. Highly Luxurious and ultra modern infrastructure of Galaxy vega is all you want for your family and loved ones. Situated in the prime location of Greater Noida it is the best ever residential project which is best for all reasons. The fantastic infrastructure and ambience of Galaxy Vega make it as similar as some international resident project. Galaxy Vega provides you 2/3bhk residential flats with all ultra modern facilities which include flooring, furnishing, walls and ceilings, modern toilets, electronic appliances and internet facility as well. To realise the value of the exclusive property with perfection you must go for Galaxy Vega. It has all you dreamt for your dream house, the residential area of Galaxy Vega contains swimming pool, spa, gym, Cineplex, shopping complex and a lot more you ever imagined for. This Year book a flat in Galaxy Vega and experience the royalty of life with your companion and family members. This is the best gift one can ever present to their dear ones. Visit the GALAXY Vega to feel the real comfort of life on a most affordable price. The prime location of Greater Noida connects it with all the prior destination of the city. You must have heard about the phrase “Live life king size” now you can also be the king of your own dynasty. Hurry, book your space today. Being an entrepreneur you can easily own your space at an affordable price. For a startup purpose Galaxy Green Arcade is a perfect match for you. It is a brand new opportunity for the small town business executives as now they can switch their business from a small town to a metro city. Being on a prime location it has direct connectivity to all Delhi-NCR areas. Are you ready to start your business? Book space now!